I really like paper-piecing. The accuracy I get with paper-pieced projects (like this one or this one) makes me giddy. I still do my fair share of “unsewing” when I paper-piece—most often because a chunk of fabric doesn’t fully cover the intended area—but my skills are rock solid. I didn’t think I needed to improve my technique until I took a class with Amy Garro. 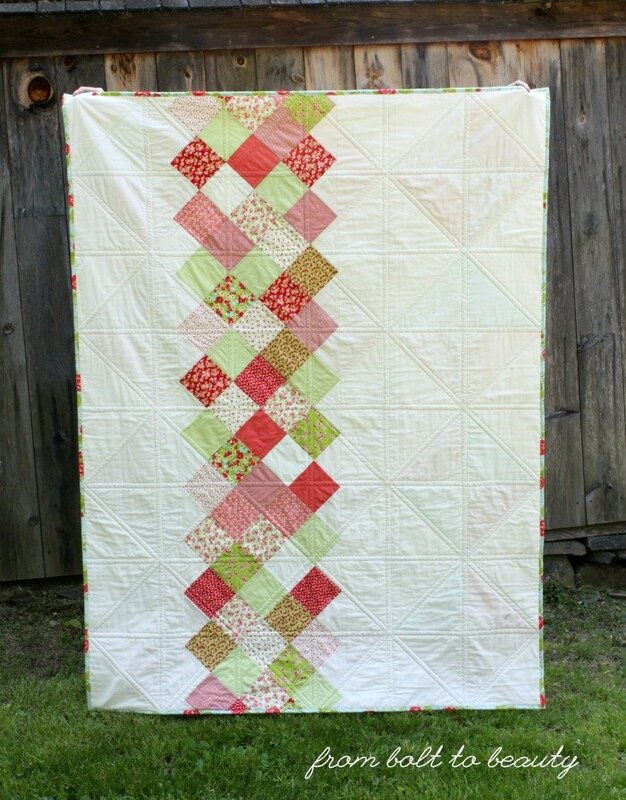 I’ve been following Amy’s blog, 13 Spools, for years (even before it was called 13 Spools!) and was excited when she came out with her first book, Paper Pieced Modern, in early 2015. Other than completing a free block from her here and there, though, I had never tackled one of her full-size quilts. That changed when my guild—the New Hampshire Modern Quilt Guild—hosted a daylong workshop with Amy. 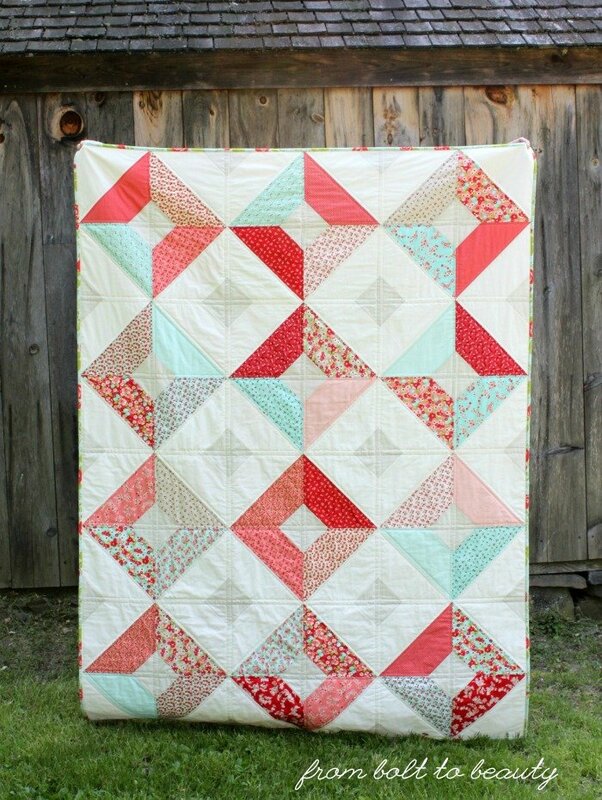 Our project was her Icy Waters design, the cover quilt from Paper Pieced Modern. If I had pieced Icy Waters outside of the workshop, I would have resorted to my old approach to paper-piecing and there would have been some unsewing. 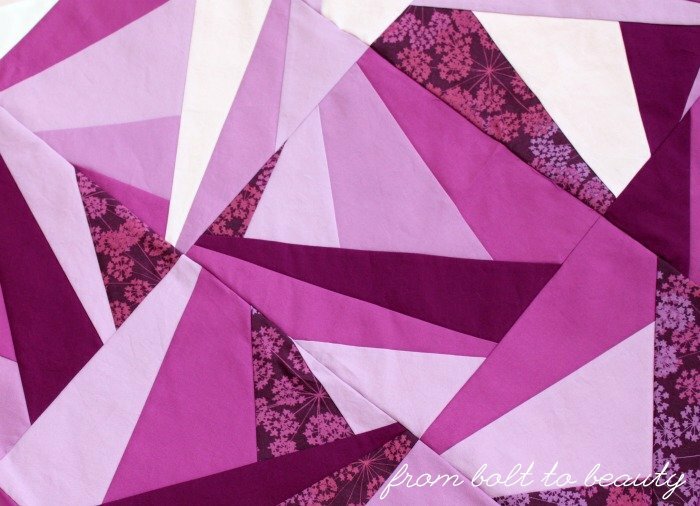 Amy, however, encourages quilters to do much of the work up front with smart cutting. Then she trims her fabric to match a seam on the pattern before sewing it. I had always trimmed the seam allowance after sewing. There’s still waste with Amy’s method, and I made some mistakes in the first block or two. After that, though, that the opportunities for screw-ups were more about organizing the blocks, not the actual sewing. I’m calling this project Grape Fizz. Right now, it’s really just grape; the fizz will come in with the quilting. 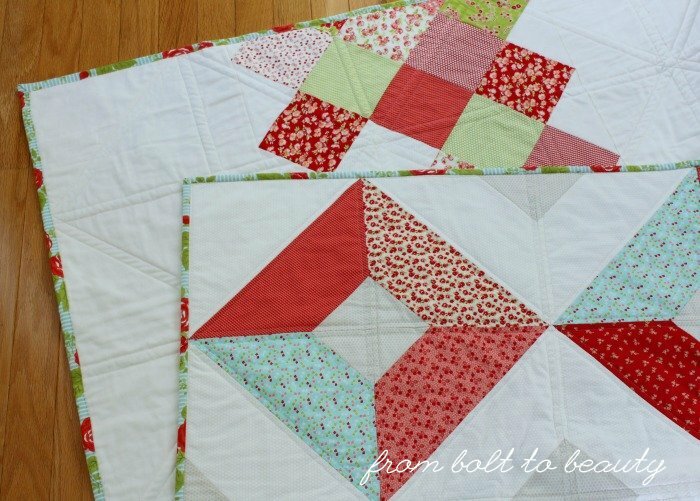 I think swirly ribbon-candy quilting will soften all of those hard lines. This color is a stretch for me. 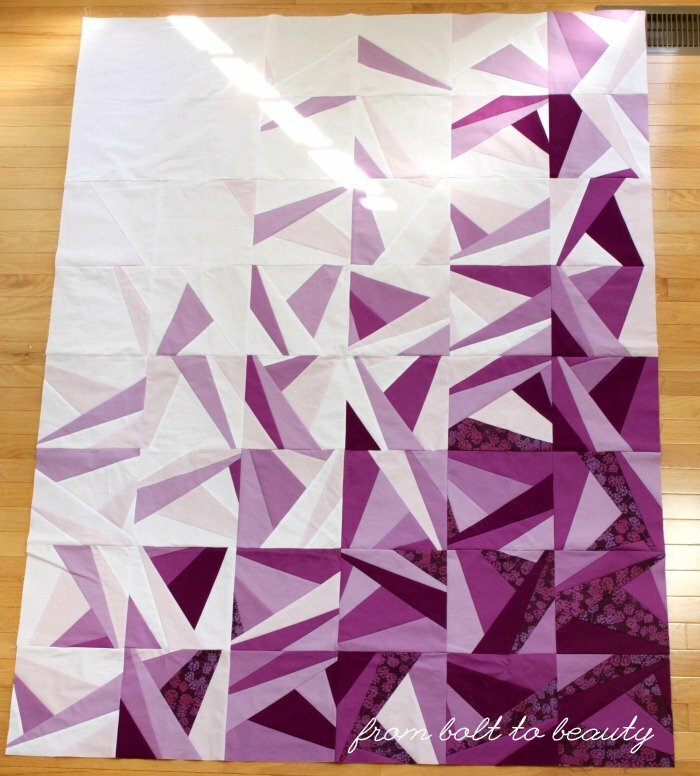 I’m no stranger to shades of purple, but I’ve never devoted an entire quilt to it. The floral by Valori Wells started me on this track, and I added various solids to achieve the ombre effect while still ensuring there was enough contrast between the colors. I’m calling it a success! What does pushing outside of your color comfort zone look like for you? Have you made the leap yet? If not, what’s stopping you?! 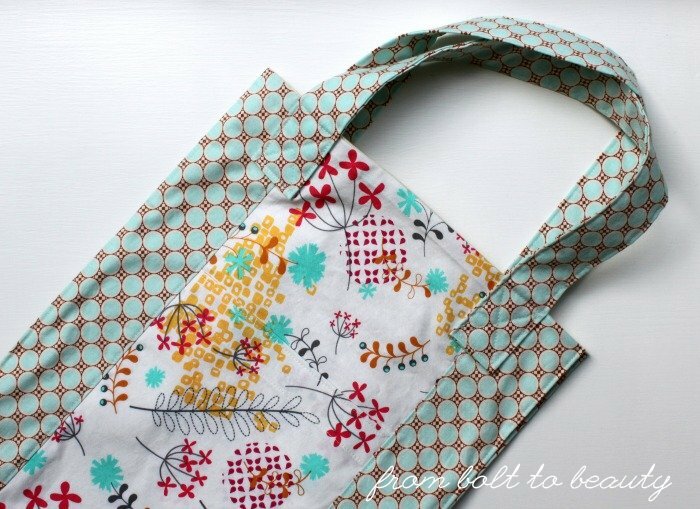 Before I was a quilter, I was a bag maker. 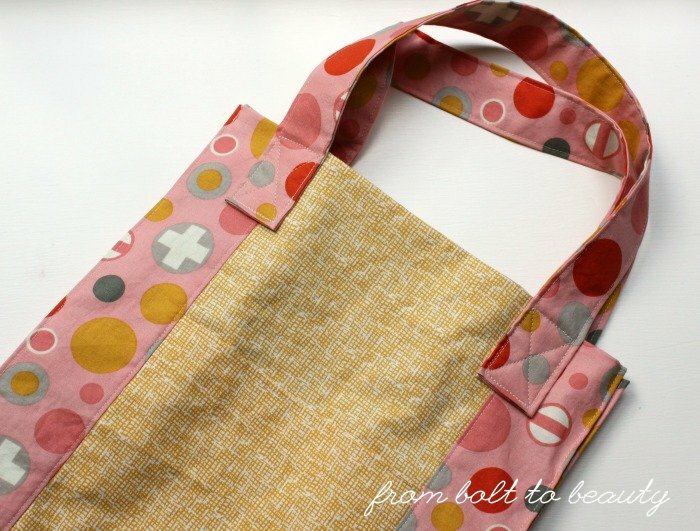 One of my favorite bag patterns is super easy and practical to boot: It’s the Jane Market Bag (JMB), by Alicia Paulson. I’ve made many of these bags—like, over 40. (A few have been blogged about here, here, and here.) 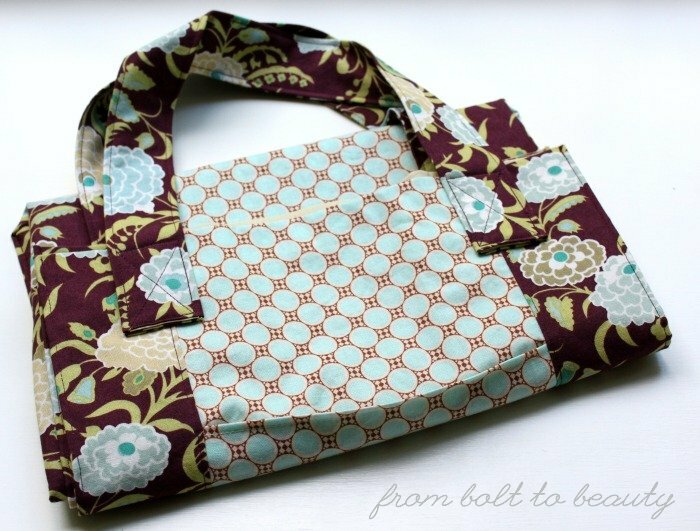 The way I make the pattern, it requires half-yards of two different fabrics and a three-quarter-yard cut of a third. Since I most often buy half-yard cuts, the JMB is perfect for stash busting. Ideally, I would have no need for a secret stash-busting weapon like the JMB. 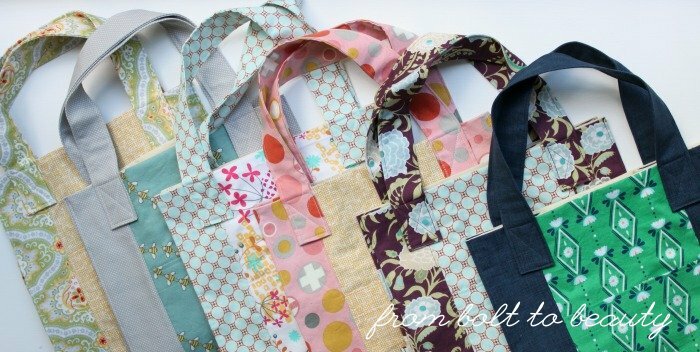 I would buy fabric for a particular project and then make that project. The net fabric gain would be negligible—just some scraps. The truth is, my stash grows in not-so-predictable ways. Can you relate to these predicaments? I buy it and then my plans change. I can’t buy for too many projects on the horizon. Sometimes I change my mind after already having purchased fabric. I had a lot of this fabulous mustard net design from Dear Stella, originally slated for another project, and it works well on the pockets here. I buy it because it’s cute and on sale. These bees from Creative Tuesday were less than five dollars a yard. 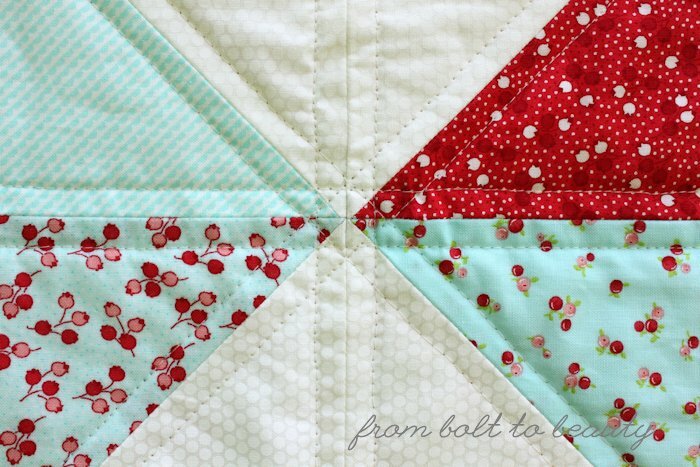 I couldn’t find a spot for them in a quilt, but paired with some subtle dots from Jen Kingwell’s Behind the Scenes collection, they’re irresistible. I buy because I might need it. I thought I would need more pink for this quilt and figured it was easier to pick some up when I was at the fabric store instead of making a second trip. As it turns out, I didn’t need it, and then it didn’t really work with anything else from my stash. Into a bag it went! I buy it because it may go out of production. I love me some Amy Butler fabric and intend to embark on an AB quilt of epic proportions someday. That day is not today, though. I thought it best to give these beauties life as a bag instead of waiting for that quilt project to happen. I buy it because it did go out of production. Pop quiz: Who designed the pocket fabric below? Rashida Coleman-Hale, when she was designing for Timeless Treasures, well before her current gig with Cotton and Steel. I had to buy some when I came across it about a year ago. But then I wasn’t sure what to do with it, so I made it into a bag. I buy it and then it doesn’t play well with others. I bought half-yard cuts of Rae Hoestra’s first fabric line, Lotus Pond. 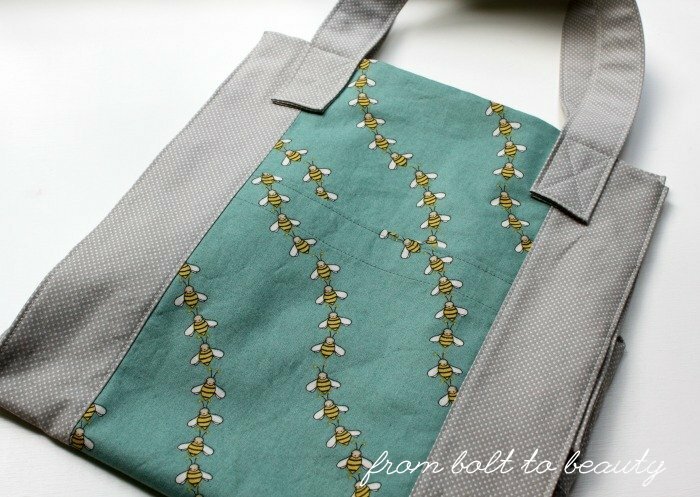 I love the fabric, but it didn’t work well with my stash—the greens and blues, in particular, weren’t what I usually sew with. (My greens and blues trend more teal and aqua of late.) 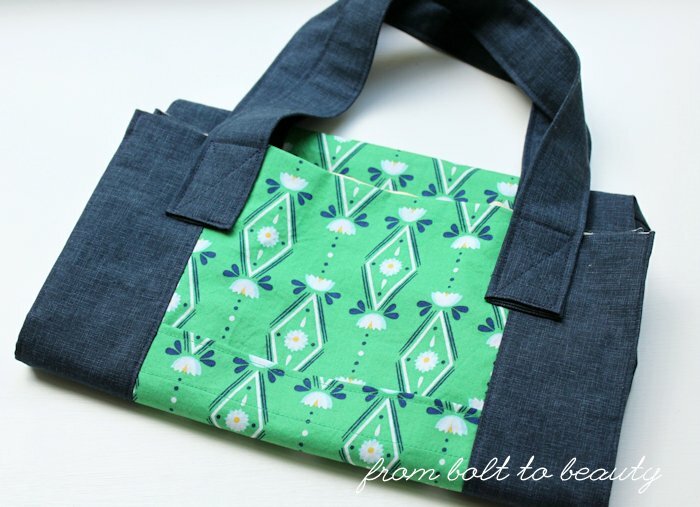 It’s beautiful fabric, though, and this green selection makes a cute and spring-y JMB. How about you? There are many ways to chip away at an unruly stash. 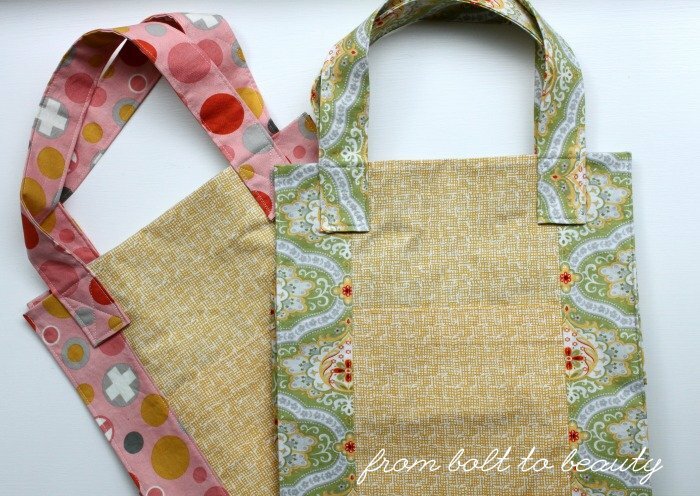 Do you whip up some pillowcases, destash on Instagram, or something else? The rest of us are dying to know! One of my goals for 2016 has been to finish a throw-size quilt every month. It’s almost halfway through the calendar year, and I’ve managed to meet this goal each month. Woo hoo! I think dividing the fabric collection into two palettes—red/pink/gray/blue and red/pink/green—underscores the idea that this is two quilts in one. Let me know if you give this pattern a try. It’s a great way to use up an orphan layer cake from your stash or an excuse to indulge in a new one.